Upcoming Events: Meg Madison, ‘thirst comes glistening out of the water’!!! ​Groundspace Project is looking forward to Meg Madison’s solo exhibition, ‘thirst comes glistening out of the water’, opening on Saturday, September 19, 6:00 to 9:00 pm. Madison’s solo exhibition consists of a series of cyanotype photograms made at water locations at the Los Angeles river, and Santa Monica and San Francisco bays. 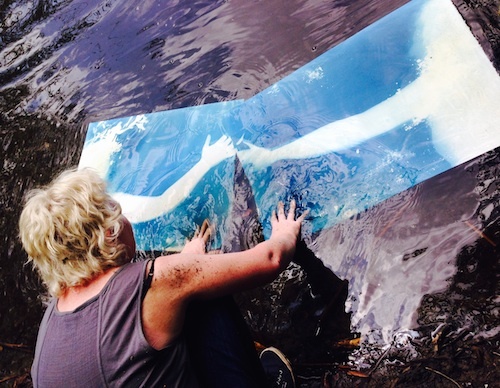 She describes the work as, “The elements of paper, water, wind, sunlight, the form of a human body and photo emulsion creates a brilliant blue print that captures the collision of materials.” A good starting point for engaging Madison’s work which evokes a complexity of figure/ground/water poetics in her powerfully beautiful art objects. Looking forward to seeing you for the opening reception on Saturday, September 19 from 6:00 to 9:00 pm. Groundspace Project is an alternative exhibition space located in downtown Los Angeles.